Iran will soon be able to build its own state-of-the-art missile defense system, if Russia does not deliver S-300 missile complexes to the country. A high-ranking Iranian official said that Russia’s refusal not to sell missile complexes to Iran would not stop the nation in the endeavor to create the air defense system. The official added that Iran would be capable of launching the production of the system in the nearest future, if needed, RIA Novosti reports. A number of officials representing the Iranian administration expressed their indignation recently claiming that Russia had not been able to execute the agreement to sell missiles to Teheran. Iranian Chief of Staff Hassan Firouzabadi urged Russia to ship the S-300 surface-air missile system to Teheran in accordance with a contract signed between the two countries months ago, agencies reported last week. Russia and Iran signed the deal to sell a batch of S-300 systems in December 2005. However, there were no official messages made to indicate the implementation of the agreement. 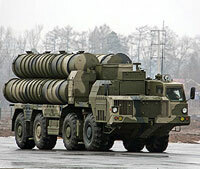 Iran’s IRNA news agency said in December 2008 that Russia had started shipping spare parts to S-300. Russia’s Federal Service for Military and Technical Cooperation said later that the information about the delivery of S-300 systems to Iran was not true to fact. Iranian officials claim that Russia does not pay much attention to the issue of Iran’s geopolitical position and Russia’s security. S-300 is a Russian-made missile complex designed to defend large industrial and administrative objects, army bases, etc. The system is capable of destroying ballistic missiles. The most recent modifications of the system can destroy enemy’s aircraft at a distance of up to 150 kilometers. Russia previously delivered Tor-M1 complexes to Iran. The range of the complex is about 12 kilometers.